Sedna by Antony Galbraith ©2014. With permission. We explore the theme of Natality in Inuit culture with a focus on the idea of renaissance or second birth in which we recreate our Self and our role in the world. This ‘coming out’ is an event of radical differentiation we which we may move beyond the welcome of the world. Through action and words, we insert ourselves into the world differently; we make room and open a place for our Self to expand. Canada’s Inuit people lived in four Arctic regions: Nunavut territory, Nunavik in northern Quebec, Inuvialuit in the Northwest Territories and Nunatsiavut in Labrador (click here for a map of Inuit regions). After three centuries of adapting to foreigners in their midst, the Inuit are experiencing some culture loss; nevertheless Inuit culture persists through language, cultural laws, TEK and the arts. Since 1990, there has been a gradual transition to self-governance. History. Long after migrations by Siberian ancestors populated North and South America, “the ancestors of the present-day Inuit, who are culturally related to Inupiat (northern Alaska), Katladlit (Greenland) and Yuit (Siberia and western Alaska), arrived about 1050 CE” (Freeman, 2014, np). The Little Ice Age (1550-1880 CE) caused a decline in game animals and forced the Inuit to abandon their winter settlements and revert to a nomadic way of life to hunt meat in winter, using igloos as temporary dwellings. Language. Inuktitut language is strongest in the regions of Nunavik and Nunavut, but in Nunatsiavut and Inuvialuit regions, only 13% of inhabitants speak Inuit language (Petrasek-MacDonald et al, 2013, np). In spite of some political gains by the Inuit, English is still the language of instruction in schools, with only forty-five minutes of instruction in Inuit language in most schools (Rasmussen, 2011, np). EcoSocial Life. Inuit have a long history of living in harmony and balance with land and sea. For millennia, the Inuit used local resources to make their own clothes, built homes, hunted, fished, and raised their families. They supplied their own health care, recreation and education, and used dog-teams to travel great distances. The fur trade brought devastating diseases and moral compromises with the traditional Inuit ethical code. Most Inuit households harvest at least half their meat and fish locally and share locally harvested food with people in other households, according to traditional values. After 1939, the Inuit nomadic way of life ended when the Canadian government compelled them to settle in towns with heated homes. Other colonialist policies that damaged Inuit culture include residential schools, systematic removal of children from their families, the disk numbering system, proselytizing by missionaries, and killing of sled dogs. The federal government currently provides housing, health care, education, employment opportunities and social services. Multi-generational trauma to Inuit culture is manifest in the suicide rate among Inuit children and teens which was 30 times higher than that of youth in the rest of Canada during the period from 2004 to 2008 (Statistics Canada). In 1953, Canada granted Inuit the right to vote and in 1962, ballot boxes were placed in Inuit communities for the first time. Climate change is having a devastating affect on the Inuit who have been observing changes in sila (climate of air and water) that date back to when the missionaries arrived. The melting of Arctic sea-ice is changing travel conditions and access to hunting. Houses and roads built on permafrost are subject to heaving. In the face of rapid climate change, there are concerns about preserving Inuit culture, Elder and senior well-being, and the capacity of youth to make climate change adaptation (Petrasek-MacDonald et al, 2013). Inuvialuit residents of the High Arctic witness dramatic changes to their landscape and their way of life. Exotic insects, fish and birds have arrived; the sea ice is thinner and farther from the community, carrying with it the seals upon which the people depend for food. Fall storms are more frequent and severe; thunder and lightning have been seen for the first time. Photo credit: CFWE Radio. Throat singing was traditionally used to sing babies to sleep or in games women played during the long winter nights while the men were away hunting. 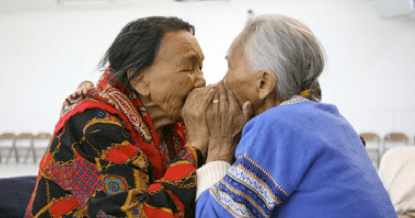 Throat-singing was banned in the area over 100 years ago by Christian priests, but it is experiencing a recent revival, especially among younger generations who believe that learning it from their elders connects them with Inuit strength and tradition. Unlike Tuvan throat-singing, the Inuit form of throat-singing is practiced almost exclusively by women. Inuit cosmology has no divine parents or rulers. Daniel Merkur interprets the Sedna myth as the contextualization of human relations within an ecological cosmology. She is a cultural imaginary of right relationship with nature and the consequence of causing imbalance to the relationship. Sedna is “indweller” or “numen”- a force indwelling in humans and in all of nature; she is not a goddess or deity. Sedna represents a significant element in Inuit cosmology – an explanation of relationality between humans and nature. Sedna, as indweller or numen, is a concept similar to the scientific concept of gravity, just as sila is like the scientific concept of climate force (Leduc, 2010, p.132). Sedna, as mortal daughter, was self-determining in that she resisted the expectations of her father; she made her own choices about whom she would marry and where she would live. After Sedna’s transmutation to Sea Woman, she continues to live in “the human condition” of loving the world and being interdependent with the human family. Sedna of the Sea expresses a full range of emotion, from angry frustration to tender mother love. Her anger is unleashed in the form of storms and withholding sea animals. Anthropologist Franz Boaz’ interprets Sedna as a temperamental anthropomorphic deity who exercised “supreme sway over the destinies of mankind” and demanded rituals to propitiate her if she was offended. Stott follows Lévi-Strauss’ theory of mythology and interprets the Sedna myth as a series of dualistic tensions which must be reconciled in order for life to continue (Stott, 1990, p.200). These interpretations impose Western dualistic concepts onto a shamanistic cosmology – a tendency which Haarmann critiques as “modernity’s utility syndrome” (Haarmann, 2007, p.158). Sedna’s hair becomes entangled when hunters are irresponsible and break taboos regarding hunting and eating animals. If hunters show disrespect for the souls of animals, Sedna’s hair becomes dirty with the souls of animals who will no longer be released to hunters. Starvation is a potential result if Sedna withholds too many animals. When Sedna’s hair becomes dirty and entangled with the souls of animals, she becomes irritable because, without fingers, she cannot comb her own hair. Eventually she becomes so angry that she unleashes her anger through storms. A shaman who is skilled in diplomacy and in journeying to the underworld travels to Sedna to ease her frustrations by combing her hair and braiding it, and also to renew the camp’s relationship with her (See “Shaman Combing Sedna’s Hair” by Inuit artist Germaine Arnaktauyuk). Inuit culture is rich in ritual and ceremony. The Inuit, like the Buryats, believe that all living things have more than one anirniq (soul). The belief that all sea and land animals have soul makes killing an animal comparable to killing a person. The Inuit acknowledge the peril of a culture which exists on a diet that consists entirely of souls. Rituals are necessary to express gratitude for the souls of sea and land animals that have given their life to feed a people. The Sedna feast is not celebrated on an annual basis but only when bad weather or scarcity of game requires it because Sedna is not releasing the animals. The feast is celebrated when the camp is under pressure from hunger. Its purpose is to renew relations with Sedna. After the feast, two masked shamans, dressed up as a male/female couple, organize the pairing of couples for the “rejoicing” – the exchange of sexual partners. Traditionally, pregnant, menstruating and elderly women are excluded. In contemporary communities, Inuit who have converted to Christianity may exclude themselves. The shamans, using slap-stick humour, poke fun at the pairs who must restrain their smiles and laughter until they leave the feast house to spend the night together at the man’s house. The temporary husbands are called “Sedna mates” and any children of these unions are “the offspring of Sedna” (Laugrand, 2010, p.77; Peck, 2006, p.310). Some scholars interpret the ritual as appeasing, placating and propitiating Sedna (Thursby, 2011, p.193; Stott, 1990, p.199); however I interpret the Sedna feast as conscious and ecstatic participation in a reciprocal relationship with the cosmos. Several male ethnographers denigrate the Sedna feast as a “wife-swap” or “wife-exchange”, implying that women have no agency in the ritual and that it is devoid of spiritual meaning. There is a paucity of feminist ethnography on the experience from the perspective of female participants. Sila is a word with deep and complex meanings. It is often over-simplified as weather. It means wisdom of the dynamic spiritual forces which push and pull us through life. Jaypeetee Arnakak, Inuit philosopher, described sila as an ungendered entity that is both animated and sentient. Sila does not personify humans; humans are the personification of Sila. “Sila is really a no thing because snow is not sila, rain is not sila, wind is not sila, clouds are not sila – they occur in sila…Sila is like empty space” (Leduc, 2007, p.242). Silatuniq means the wisdom that gives people the practical knowledge for living on the land. Sila is an important word because it refers to dynamic change that occurs in a systemic way, like climate change. It also compels one to “think of responsibility to self and the other, and it also contextualizes the self into its environment” (Arnakak cited by Leduc, 2007, p.244). One Inuit elder said that sila means ‘everything is connected’; it is the life force within everything that connects all life, time, energy and the physical world. A scientist might call this a biosphere. Sila cannot be reduced to TEK; it is Inuit Qaujimatuqangit (IQ), a form of ecological intelligence that integrates both science and cosmology (Hrynkow, 2011, p.110). Leduc advocates intercultural dialogue between Western scientists and Inuit elders in order to awaken the Western imagination to a deeper sense of interconnectedness with nature and to develop an effective response to climate change not only in the Canadian North, but also in all cultures. The first birth of Sedna was as mortal daughter of human parents. Sedna’s choice to marry a dog and have dog children moved her beyond her father’s welcome. Her choice differentiated her from the person of her first birth and re-configured her relationship with the world. In her second incarnation, Sedna is Sea-Woman, origin of all sea animals. In this new space at the bottom of the Sea, she remains emotionally interdependent with her people, and continues to relate to them like intimate family – anger, revenge, love, tenderness, generosity, distress and other chaotic humanness. This is the human condition – to live in families that drive us to frustration with their dysfunction, a frustration that is tolerable only because the primary bonds of love are strong beyond reasoning. Sedna’s transformation from human woman to Sea Woman was consistent with her capacity to merge with other life forms (i.e. dogs, fulmars) and to learn their ways, blurring species boundaries but not soul boundaries. Thus Sedna, as anirniq-angakkuq (soul that is shaman) intersects with the souls of all beings. According to Inuit nondualistic and organic cosmology, being human was not distinct from also being dog, bird, and sea-mammal. In summary, the Inuit cosmology of Sedna illustrates the theme of Natality by illuminating the human capacity for ‘coming out’ as a differentiated person determined to reconfigure the world in a different way and willing to take responsibility for who she is and what she does. Sheila Watt-Cloutier is a Canadian Inuit activist in her work as an academic, a politician and a filmmaker. 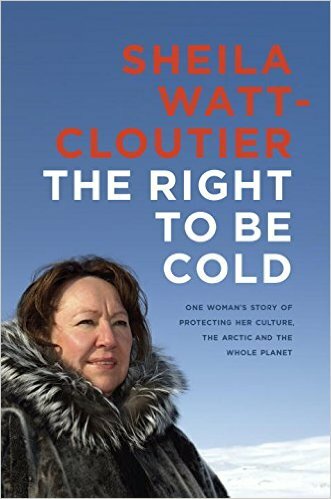 Now she’s released her highly-anticipated first book: The Right to Be Cold: One Woman’s Story of Protecting Her Culture, the Arctic and the Whole Planet (2015). She has been a political representative for Inuit at the regional, national and international levels, most recently as International Chair for Inuit Circumpolar Council. Hrynkow, C. (2011). Review of Climate, Culture, Change: Inuit and Western dialogues with a warming north by Timothy Leduc. The Trumpeter, 27(3), 110. Retrieved from http://trumpeter.athabascau.ca/index.php/trumpet/article/viewFile/1272/1596. Laugrand, F.B. & G. Oosten, J.G. (2010). Inuit shamanism and Christianity: Transitions and transformations in the twentieth century. McGill-Queen’s Press (Google eBook). Leduc, T. B. (2010). Climate research, interdisciplinarity and the spirit of multi-scalar thought. Religion and dangerous environmental change: Transdisciplinary perspectives on the ethics of climate and sustainability, 2, 119-144. Leduc. T. (2007). Sila dialogues on climate change: Inuit wisdom for a cross-cultural interdisciplinarity. Climatic Change, 85, 237-250. Peck, E.J. (2006). Apostle to the Inuit: The journals and ethnographic notes of Edmund James Peck: the Baffin years, 1894-1905. University of Toronto Press. Petrasek-MacDonald, J., Harper, S. L., Cunsolo Willox, A., Edge, V. L., & Government, R. I. C. (2013). A necessary voice: Climate change and lived experiences of youth in Rigolet, Nunatsiavut, Canada. Global Environmental Change, 23(1), 360-371. Rasmussen, D. (2011). Forty years of struggle and still no right to Inuit education in Nunavut. Interchange, 42(2), 137-155. Sonne, B. (1992). Mythology of the Eskimos. In C.Larrington (Ed. ), The woman’s companion to mythology (pp.162-188). Harper Collins. Stott, J. C. (1990). 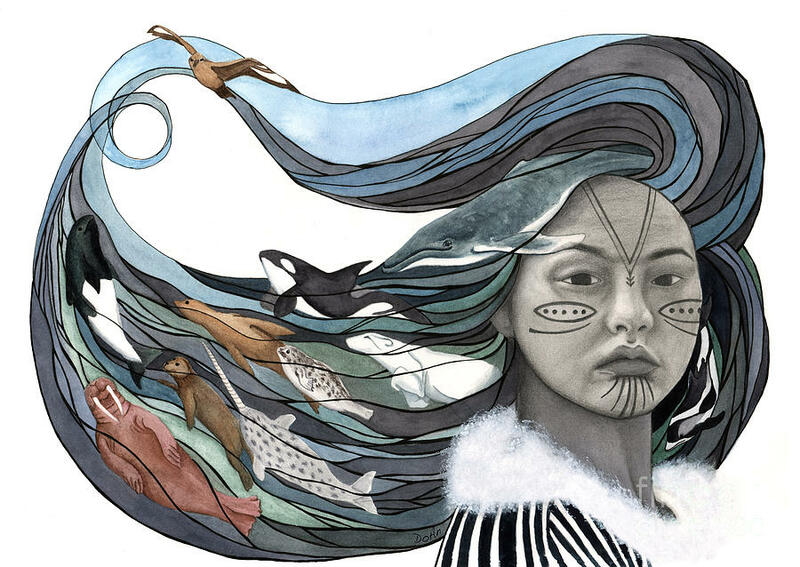 In search of Sedna: Children’s versions of a major Inuit myth. Children’s Literature Association Quarterly, 15(4), 199-201.